Voila, you’ve got even more choices for your desktop backgrounds. 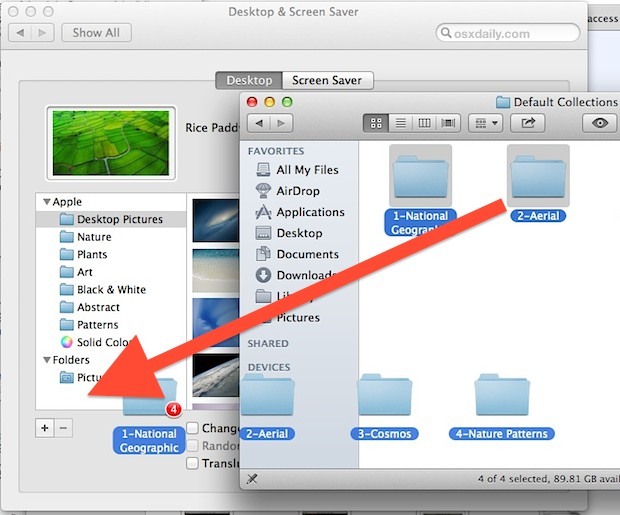 Sometimes the best tricks are the easiest, and this one is particularly useful if you don’t want to make duplicates of images, or you’d like to get easier access to that huge group of amazing hidden wallpapers buried in OS X Mountain Lion. From the Desktops preference panel you can also click the little [+] icon and follow it up with some Go To Folder magic to get there as well. Thanks to Dezza for pointing out the [+] button tip, and thanks to Mani for leaving the drag & drop tip in our comments. The “add folder” at the bottom left of the panel keeps forgetting the folders I add ever since upgrading to Mountain Lion. Hopefully this tip will fix that. For me, it only remembers the folder that has the active desktop background. For example, I dragged all four of those folders in. If I select a picture from Cosmos, then that folder sticks around… the other three disappear. If anyone knows a way to make them all stick, that would be great. I’d like to go add these folders to my mothers Mac next time I visit her. Worst case, I’ll just copy them to one folder and link that. There is an even easier way. Just leave the images were ever you want and just drag it on the freeware Desky. You can drag Desky itself to the side bar or top to the menu, so you allways can change the desktop image very quick. I have the same problem. System preferences keeps forgetting. The folders disappears as soon as i close it and reopen it.